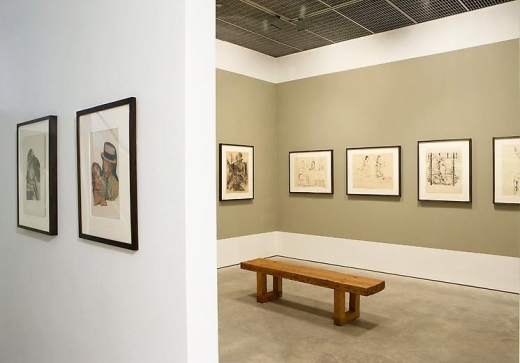 verso: annotated "17 battle 2"
David Nolan Gallery is pleased to present the first major George Grosz exhibition in the United States dedicated exclusively to his years in Exile. 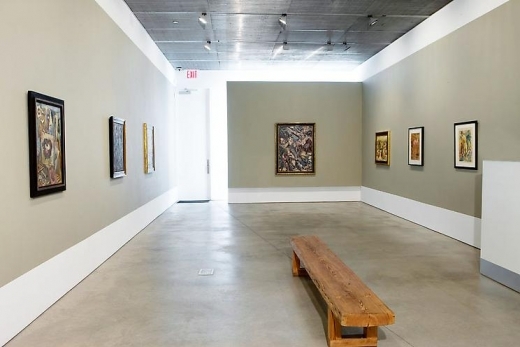 The works on view – paintings, watercolors, drawings and collage – allow for a reassessment of this pivotal figure of 20th century art. For 27 years, more than half of his artistically productive life, George Grosz lived and worked in the United States. 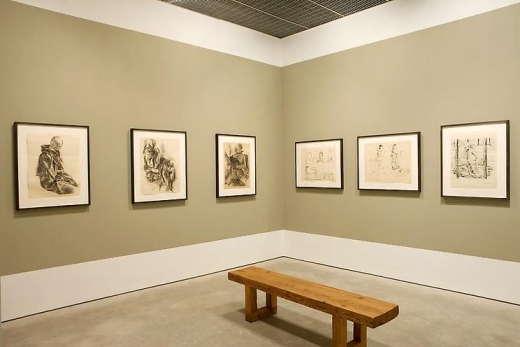 The fact that it is only now, 50 years after his death, that a comprehensive exhibition is being dedicated to this important period speaks volumes of the helplessness that has hitherto characterized the art world's reaction to the complex and contradictory character of Grosz's work. 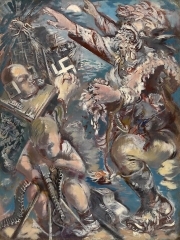 One widely held opinion states that Grosz lost his much-admired audacity upon immigrating to New York; that he miraculously turned apolitical during the crossing aboard the Stuttgart in January 1933, while Nazi henchmen were ransacking his studio in Berlin. 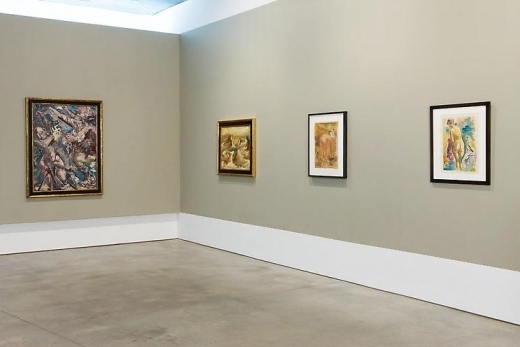 Whatever Grosz would paint, draw, or say over the course of following quarter of a century, it was always overshadowed by his socially critical, satirical work of his Weimar years. 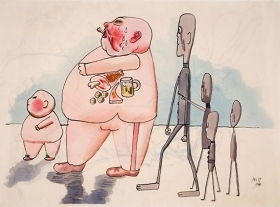 Few have visually shaped an era as George Grosz did with the interwar years, through his drawings and portfolios. 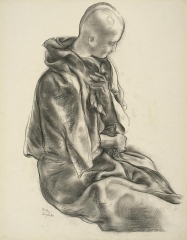 For this he was loved and hated, tried in court, and declared a "degenerate" artist. 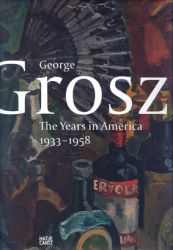 On first sight, it appears as though after Grosz's immigration there is little left of his fearlessness, his fiery agitation. 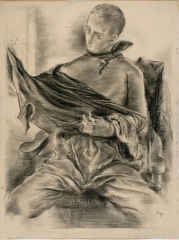 By accepting a teaching position at the Art Students League, he executed a radical break with his old life. 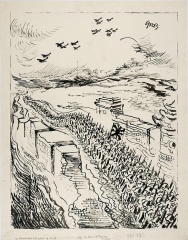 He not only escaped from a regime that saw him as an enemy; he also left Germany in bitterness about the country's workers' movement and intellectual left who yielded to the Nazis almost without a fight. 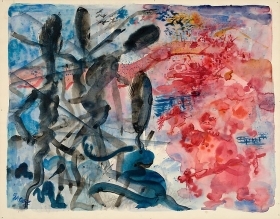 His statements ("The air in Manhattan had something inexplicably exciting about it, something that spurred my work onwards… I was filled with light and colors and joy") hint at how liberated Grosz felt by leaving behind not only Germany, but also the obvious defeat of his own artistic mission. 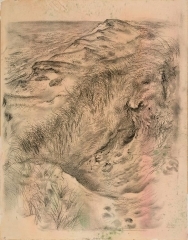 Released from the corrosive bitterness of the issues to which he kept returning in Germany, he turned towards the New World full of optimism and amazement. 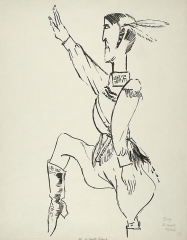 He arrived in New York as a lover: already in 1916 he had played with the idea of emigrating to the US, and preemptively anglicized his last name from Groß to Grosz. He also arrived as an admirer of the open society. He could not, nor did he want to, comment on the situation in the America with the same acerbic wit that he had used to chastise Prussian militarism. 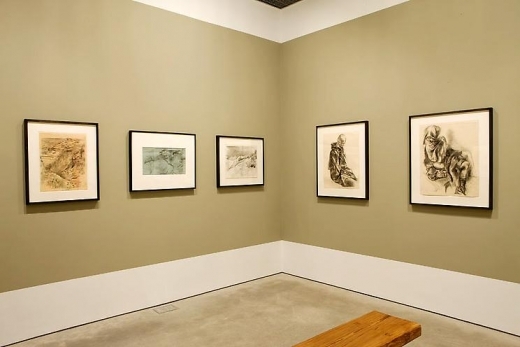 But it was precisely this witty, extremely critical political artist who was admired by the American public, who was familiar mostly with Grosz's portfolios. 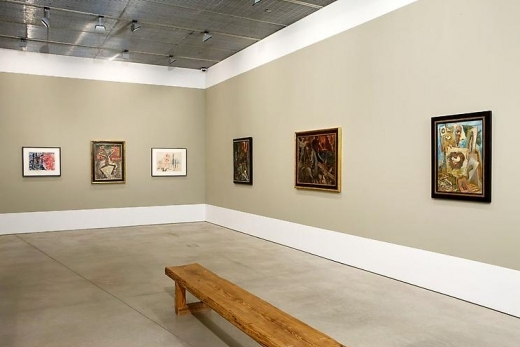 The first two years saw the production mostly of street scenes and cityscapes that stylistically followed in the vein of the Berlin years. 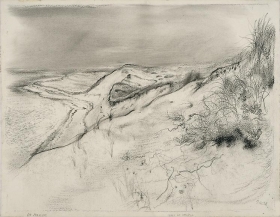 Soon, however, cracks began to appear in the hopeful dreams, and pessimism and depression caught up with Grosz. The commercial success he hoped for never materialized, he increasingly saw his teaching job as a burden, and news from Europe, not only from Germany but also from the Spanish civil war, confirmed his worst fears. 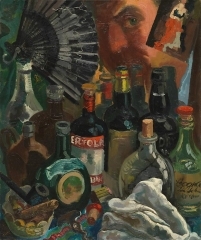 When in late 1935 Grosz once again began to paint in oil, he produced extremely gloomy landscapes alongside family portraits and still lifes. 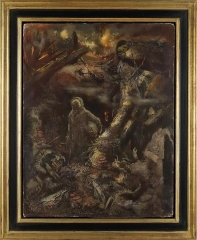 More and more he felt a kinship with old masters like Bosch and Bruegel, whose premonitions of the Thirty Years' War inspired him on the eve of World War II to depict the apocalypse in a style reminiscent of the old masters. 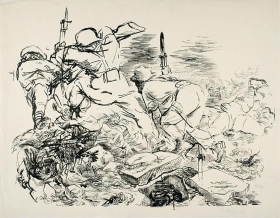 At the same time, Grosz was working as an illustrator for Esquire and Vanity Fair, and contributed drawings to short stories by Ben Hecht and O. Henry. These activities, too, bore with them disappointments: his large, carefully executed works were often reduced to mere stamp-size. 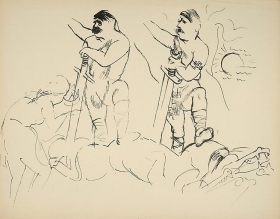 "Oddly enough, I was never able to approach the very simplicity and normality of American illustration that I admired so much," Grosz admitted. 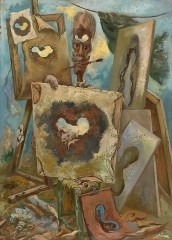 In 1936 he tried to replicate his major successes of the 1920s, Ecce Homo and Der Spießer-Spiegel, with the portfolio Interregnum. Similar success, however, was not forthcoming. 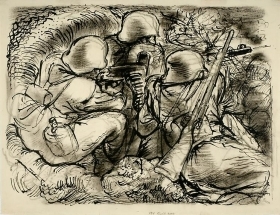 Grosz found moments of happiness with his wife Eva and his sons Peter and Martin on the beaches of Cape Cod. 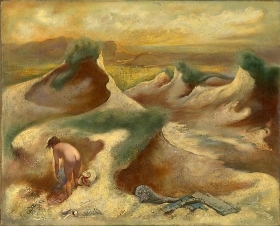 A number of drawings, watercolors and oil paintings of the dune landscape attest to Grosz's fascination with nature as an artistic topic: the dunes are populated by naked women in more or less explicit poses, and even those landscapes devoid of people remain charged with an obvious eroticism. 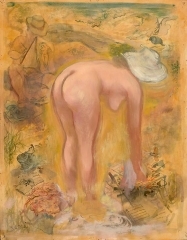 The quiet landscapes and nudes were cause for criticism and disappointment among old friends and admirers. 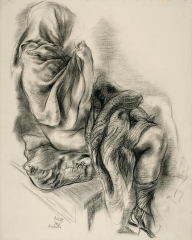 Grosz confessed to being a romantic, and paraphrased a passage by Walt Whitman: "Do I contradict myself? 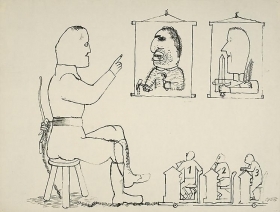 / Very well then, I contradict myself, / I am large, I contain multitudes." 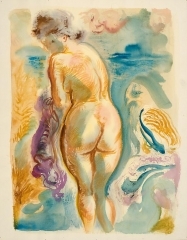 Grosz's connection to this stanza is key to understanding his artistic personality, particularly of the American years. 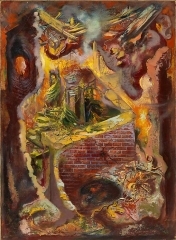 Here he created not only landscapes and acts, but at the same time highly political works he called "images of hell." 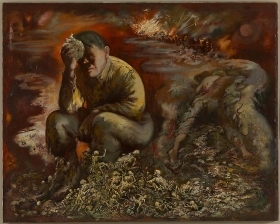 In these works, where he gives up beauty for the sake of drastic imagery, he conjures up the end of civilization and sees hell on earth come to pass. 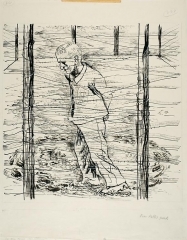 He reacted with artistic rage to the torture and murder of his old friend Erich Mühsam by the Nazis and to the stories told by the writer Hans Borchardt after his release from a concentration camp. 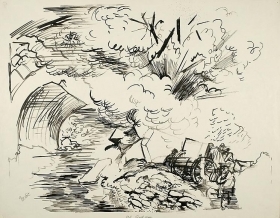 The longed-for end of the war brought with it the recognition that humanity was now threatened with a nuclear apocalypse. 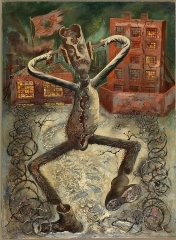 The Stickmen, post-nuclear creatures without bodies, is Grosz's last major group of works, culminating in the haunting Painter of the Hole. 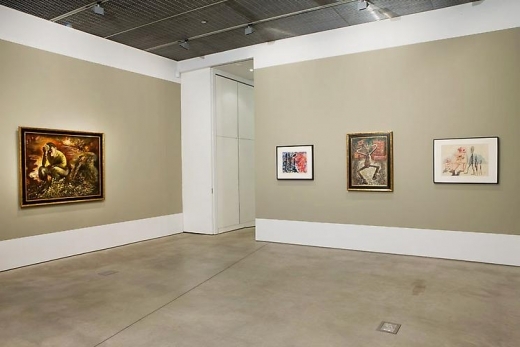 He bade farewell to America with a group of collages, a joyful return to a technique of the Berlin years: "You stay Dada all your life." 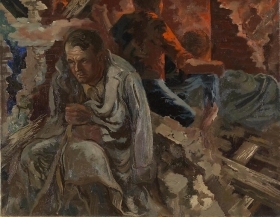 Grosz died in July 1959, only a few months after returning to Berlin. A 272 page hardbound catalogue published by Hatje Cantz in conjunction with David Nolan Gallery and Nolan Judin Berlin will accompany the exhibition. 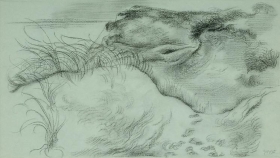 The catalogue will feature 250 color illustrations, 50 black and white illustrations and text by Ralph Jentsch, Jürg Judin and Barbara McCloskey.